UBUD, Indonesia – Given the situation, I was moving as fast as I could. I was walking cautiously on a foot-wide earthen berm separating water-soaked rice paddies. A big cross-body garbage bag banged against my hip as I clutched a 6-foot pole with a pointed metal tip. Sweat ran down my back as I speared yogurt cups, candy wrappers and plastic bags. It was our first full day on the Indonesian island of Bali, and nine of us were on a “trash walk” near the upland town of Ubud in the heart of the island. The walk was organized by Cynthia Hardy, a friend who had invited us to Bali. She moved to the island in the ’80s and has been here, on and off, ever since. With Cynthia in the lead, we traipsed through terraced green rice paddies, along slippery brown riverbanks and centuries-old waterways in search of demon trash. We picked our way past men, women and children bathing in the irrigation canals, the heart of the Balinese irrigation system known as subak, so unique that UNESCO has designated it a World Heritage site. Toward the end of our walk, we came upon a woman selling durian, a football-size fruit with a hard, spiky shell. Cynthia bought one, broke it open and tried to entice us to eat the fruit, whose scent is a nauseating mixture of sweaty socks and rotting garbage. If you can get past the smell, she assured us, it tastes like a stick of Juicy Fruit gum. I tried, but gagged and had to spit it out. For the American traveler, the word “Bali” conjures up a lush image of magic, spirituality and possibilities. It’s an island of Hindu gods and temples in a nation with the largest Muslim population in the world. What is usually missing from the Bali of our imaginations is the reality of an island struggling to maintain its identity even as it has become a tourist haven – and the rare target for Islamist terrorists. New wealth has meant that Bali’s roadways are overrun by motorbikes. Its waterways and rice paddies are choking on trash. You can overlook the problems, or engage with them, as we tried to do on our trash walk. But however you experience Bali, you will be charmed by its spiritual people, its intense beauty, and its tropical melange of fecundity and decay. My nine-day visit to the island in November was unusual, but anyone can replicate the itinerary. I went to Indonesia because of my friendship with the Hardys; I paid for my accommodations, airfare and the rest of my trip, in keeping with Los Angeles Times policy. Nine women, most of them friends of Cynthia’s since her childhood, had come to visit. We put ourselves in her experienced hands, and she arranged treks, day trips, shopping outings, dinners and, of course, yoga classes. We were all eager to know more about the multifarious world that Cynthia and her husband, John, have created here, all in the cause of promoting sustainability. The Hardys first became known for their jewelry business, which John founded in 1975. A tour of the workshops and design center was high on our to-do list. The company employs hundreds of Balinese artisans. After our tour, we sat down with some of the company’s employees for a lunch of corn fritters, fish wrapped in banana leaves, salad, rice and banana cake. Happy and full, we meandered into the boutique, a 90-foot-tall bamboo marvel that looks like a ship’s hull and appears to float on rice paddies. 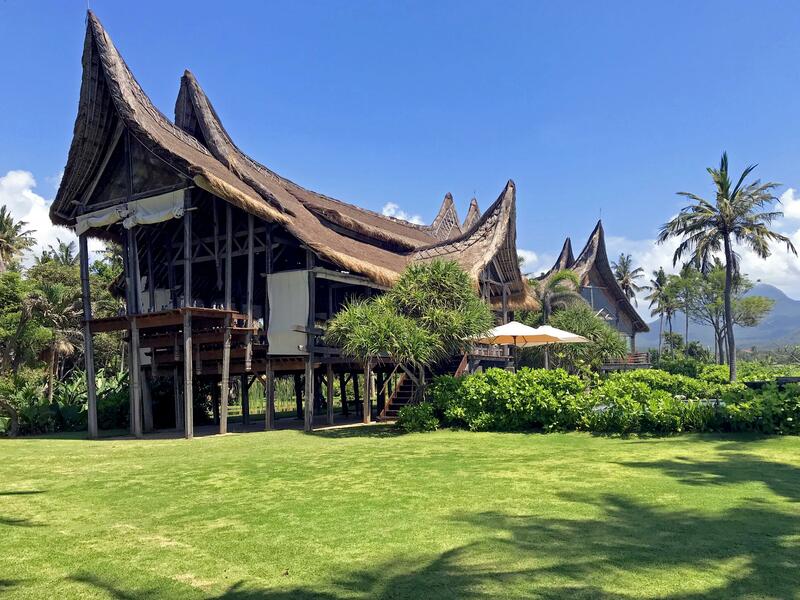 About a decade ago, the Hardys sold the business, which gave them the means to create the eco-centric luxury hotel Bambu Indah, the private Green School and Green Village, a small community of spectacular, custom bamboo homes designed by John’s daughter Elora Hardy. The Bambu Indah is built on a ridge overlooking the Ayung River, its 2 1/2 acres dotted with vegetable gardens, coconut and frangipani trees, and rock-lined pools that look like natural ponds. The accommodations consist of 11 antique Javanese bridal houses, charmingly rustic but with fridges, AC, good lighting and plumbing. Before dinner one night, I was lolling in my spacious cottage, Afrika House, ensconced behind white muslin bed curtains, safe from mosquitoes. The frogs were just starting their nightly arias when the rhythmic sound of bells and drums wafted into my room. The mysterious sound would swell, subside, then rise again. I walked out of my cottage and wandered into the hotel’s open-walled restaurant where I found a dozen or so Balinese musicians sitting on the floor making hypnotic music with metallophones, which look like xylophones; bonangs, which look like brass kettles; and drums. It was a traditional Balinese gamelan orchestra. As we sat down at a big round dinner table, servers and cooks fussed nearby with a whole roasted pig on a spit. After we finished our feast, the orchestra accompanied a topeng dance in which elaborately costumed dancers in grotesque masks acted out Balinese folk tales. Even without knowing the stories, it was easy to see that good triumphed over evil. Most visitors do not rent cars on Bali and instead hire drivers, easy to do through hotels and local companies. This is the safest choice, because Bali streets are choked with motor scooters and driving is on the left side. The obstacles on any given road make driving daunting. One day, our Bambu Indah drivers took us from Ubud to Karangasem, a two-hour drive to Bali’s east coast, where we planned to spend one night. On the way, we visited the ancient village of Tenganan, whose residents are known as Bali Aga, or original Balinese. Theirs is a closed society; you can live in the village only if you were born there. If you marry an outsider, you must leave. There was a small fee to enter the village. The homes on either side doubled as workshops and stores. Inside one, we watched women weaving double ikat fabric, an ancient, painstaking process that produces exquisite fabric. The prices were astronomical – $600 for a length of ikat about the size of a long, wide scarf – so I bought some fine-gauge rattan baskets and hollow eggs painted with Hindu gods instead. We arrived late in the day in Karangasem where we stayed at Villa Campuhan, a beachfront complex of six villas and a long house on the Lombok Strait. It is owned by director Rob Cohen. Cohen was drawn by the excellent surf break and the view of Mount Agung, an active volcano that plays a central role in Balinese spirituality. Cohen originally built the place for his family, but now rents it out. Visitors can book one villa or the entire complex. A staff serves meals, and there is a small spa for massages. In the morning, Starr led us on another rice paddy trek, where we bumped into a farmer planting his crop. The man was bent at the waist, calf-deep in water, shooting baby rice plants like darts into the muddy water. Again, we saw too much trash in the waterways that fed the paddies. Starr, a gentle soul with a vast knowledge of Balinese culture, said he considers the proliferation of plastic the legacy of the island’s “banana-leaf mentality.” Traditionally, Balinese food was wrapped in banana leaves – unwrap and toss. The wrappers have changed; old habits have not. He showed us what he is doing for Bali that afternoon when he took us to Sorga, his organic chocolate company. Starr’s triple-fermented dark chocolate bars were fruity with multiple layers of flavor, and you can purchase them only on Bali. As it turns out, falling into a rice paddy is more embarrassing than dangerous. You just pull your leg out of the muck, hope your shoe is still on your foot, and get on with it. At the end of our first trash walk, a three-hour expedition that left most of us soaked in sweat and feeling as if we’d done just a tiny bit of good for Bali, we made our way back to the riverbank below the main Bambu Indah complex. Here, at the river’s edge, the Hardys have created rock-lined swimming pools. Servers brought us bubur, a traditional Balinese breakfast of rice, vegetables and peanuts wrapped in a banana leaf. We scooped up the delicious concoction with our fingers, tossed the leaves aside and slipped into the water to cool off.